Since im like every other american, i am trying to lose weight after the new year…. lets see if it happens but i figured (duh) that you have to change what you eat for it to work. I realized, quickly, that eating baked mac and cheese, pioneer woman recipes (sorry ree! ), and fast food would only make me gain weight and be a waste of my gym time. 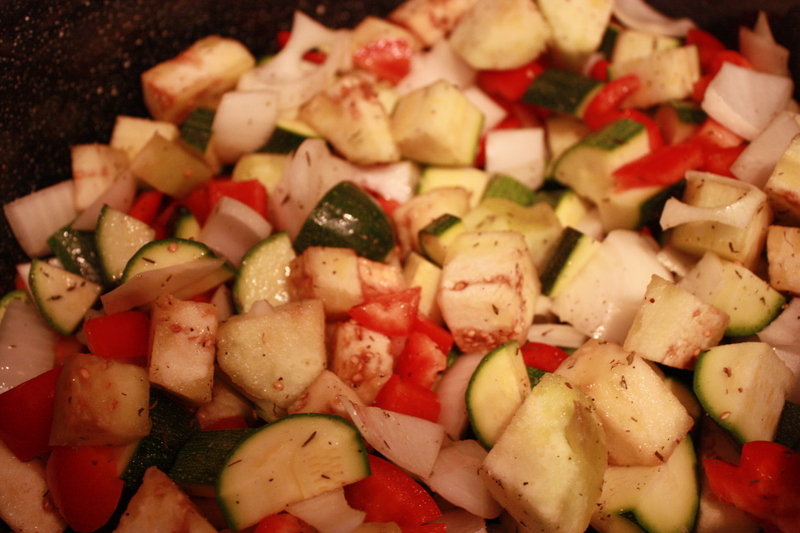 I decided to try cooking healthier, and see if my waistline smiles at me, in return. This recipe was a quick, super easy weekday meal for those of us that work late hours and just want to lie on the couch when we get home. Cut a sliver off the top of the garlic head (the pointy side up) just large enough to expose the cloves. Tear off a large square of aluminum foil and place the garlic in the center. Drizzle a small amount of oil over the head and wrap the foil up around it. Place in the oven and roast until golden brown and tender, about 45 minutes. While the garlic is roasting, cut up the veggies and place everything except the tomatoes on one or two large baking sheets (or a big roasting pan), along with the thyme. Once the garlic has been roasting for about 15 minutes, drizzle the veggies with olive oil and season them with some salt and freshly ground black pepper. Roast them in the oven until soft and juicy, about 30 minutes. Once the veggies have been in the oven about 10 minutes, place the tomatoes onto another baking sheet, drizzle them with oil and hit them with some salt and freshly ground black pepper. Toss them into the oven with the other veggies and roast until they’ve burst and shriveled up slightly, 15-20 minutes. 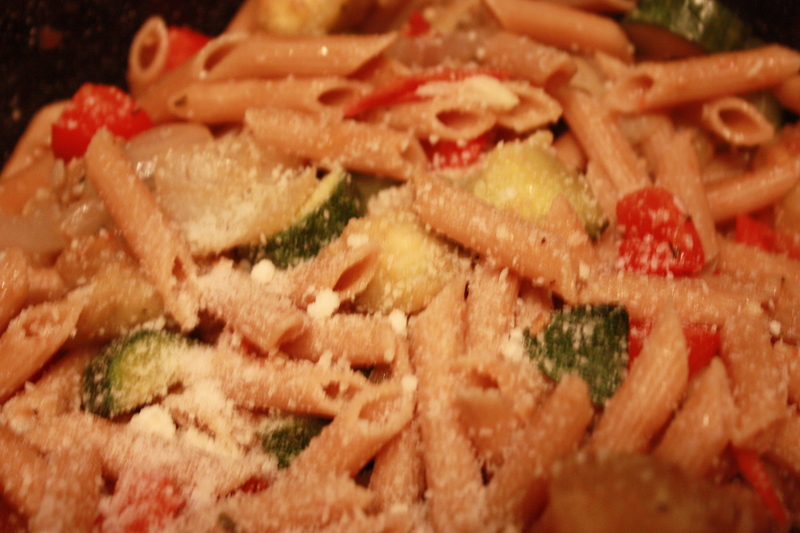 Once the veggies have about 10 minutes left to go, drop the pasta into the boiling water and cook to al dente according to package directions. 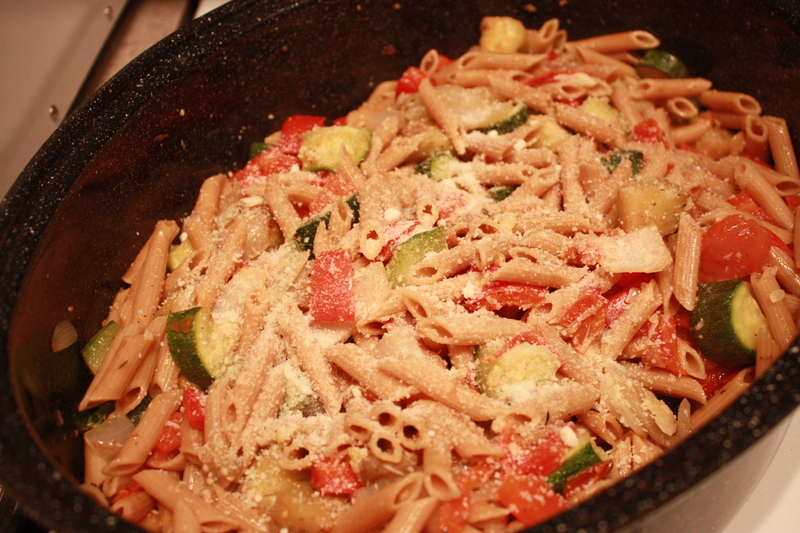 Before draining the pasta, ladle about 3/4 cup or so of the pasta cooking liquid into a large serving bowl. Drain the pasta and reserve. Once the garlic is done roasting, allow it to cool enough to handle, then hold the head in your hand over the bowl with the pasta water and squeeze out all of the roasted cloves into the bowl. Add the tomatoes and mash everything together. 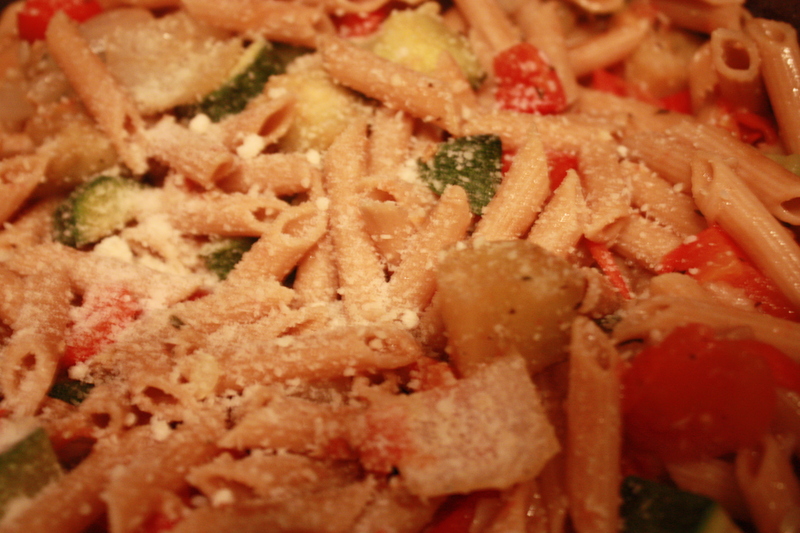 Add the roasted veggies, drained pasta, parsley and grated Parmigiano to the bowl and toss it all to combine.